In myocardial perfusion, several requirements must be met in order to acquire diagnostically meaningful data sets. The most important among them are: a) high temporal resolution, b) high spatial resolution and c) adequate coverage . However, as it is generally the case in dynamic MRI, there is a trade-off between the achievable temporal and spatial resolutions. In order to relax this trade-off and accelerate perfusion imaging, techniques which exploit either spatial  or spatiotemporal correlations [3, 4] have been proposed. Among them, the highest resolution in space and time was achieved when using k-t SENSE , which performs the reconstruction by exploiting the spatiotemporal redundancy present in perfusion images. In this work, we investigate the potential of Compressed Sensing (CS)  as a method to accelerate perfusion imaging. 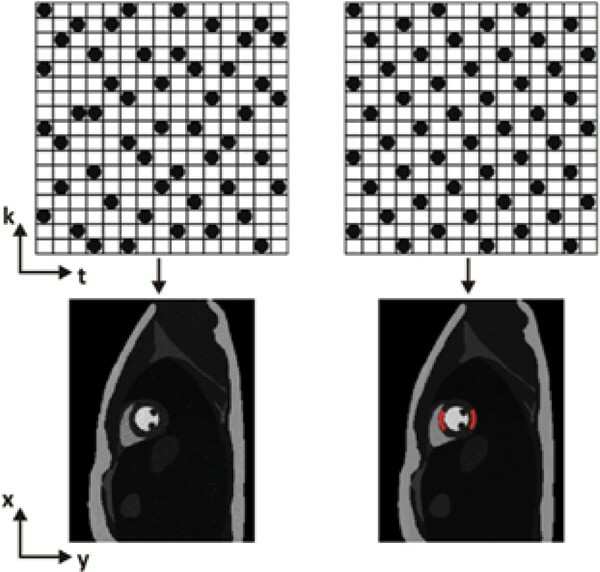 Compressed Sensing has been proposed as a method to efficiently accelerate dynamic MRI (cine, angiography)  by exploiting the implicit sparsity of dynamic images. Model simulations demonstrate the feasibility of CS perfusion and compare the method to k-t BLAST, the single-coil version of k-t SENSE. A realistic computer model was generated based on an actual perfusion scan and its sensitivity map (5 channel coil array). The reconstruction matrix was 256 × 192 with 30 dynamics. Perfusion curves for the different anatomical regions were extracted from the same scan and intensity variations in the model were simulated accordingly. Uncorrelated Gaussian noise was added to the sample k-space data, resulting in a signal-to-noise ratio of 20 on a region of the myocardium. To allow for quantitative assessment of the reconstruction result, the model was decimated to simulate nominal acceleration factors ranging from 2 × to 8 ×. For CS, the data were undersampled randomly, whereas for k-t BLAST they were undersampled using a sheared grid pattern (Figure 1). The reconstruction of the randomly undersampled data was performed in the spatiotemporal frequency domain (x-f space) using a steepest descent algorithm [7, 8] along the energy difference between the reconstructed and the measured x-f space. Random sampling scheme and corresponding Compressed Sensing reconstructed perfusion image for a 5× acceleration (left column); sheared grid scheme and corresponding k-t BLAST reconstructed perfusion image for a 5× acceleration (right column). The regions used for the quantitative assessment are indicated in red. Figures 2a and 2b compare the perfusion curves acquired for a region on the septal wall for nominal acceleration factors of 3× and 5×, respectively. It is seen that both k-t BLAST and Compressed Sensing result in perfusion curves that agree well with the curves extracted from the fully sampled reference data set. As Figure 3 demonstrates, CS outperforms k-t BLAST for low acceleration factors for the two myocardial regions indicated in Figure 1. For acceleration factors greater than 4–5, the root-mean-square (RMS) error of CS increases significantly and is typically larger than that in k-t BLAST. However, the trait of the artifacts seen for the two methods at similar RMS error levels differs, particularly for higher acceleration factors. CS features incoherent, noise-like artifacts which might be less disturbing to the eye of the observer, whereas k-t BLAST results in residual ghosting and temporal filtering. 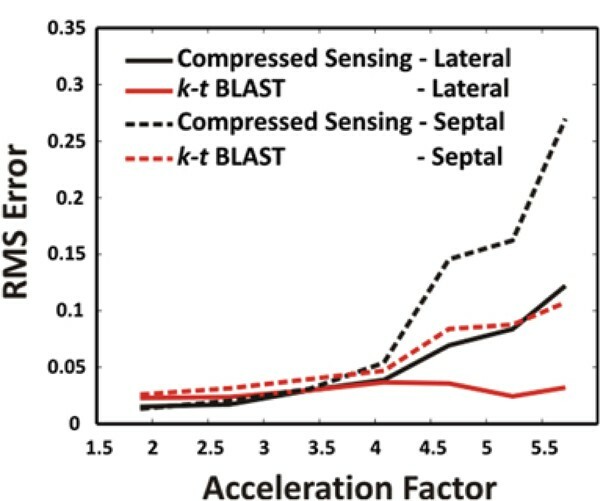 Comparison of perfusion curves from a 3× accelerated compressed-sensing and a 3× accelerated k-t BLAST reconstruction (a). Another comparison for the same region, this time for a 5× accleration (b). Root-mean-square (RMS) errors of perfusion curves from Compressed Sensing and k-t BLAST as a function of the net acceleration. The errors were calculated for two myocardial regions (lateral/septal wall). Nonlinear reconstruction methods for undersampled data feature interesting properties which can be exploited for accelerating perfusion imaging. Up to a certain critical acceleration factor (depending on the sparsity of the data and implicitly on the signal-to-noise ratio) this reconstruction is exact, resulting in high temporal fidelity comparable to that of the k-t BLAST reconstruction. It can be claimed, however, that perfusion imaging using any of the two methods and an acceleration beyond the critical one (~5×) is unreliable and techniques which exploit coil encoding as a joint encoding entity should be pursued [9, 10].